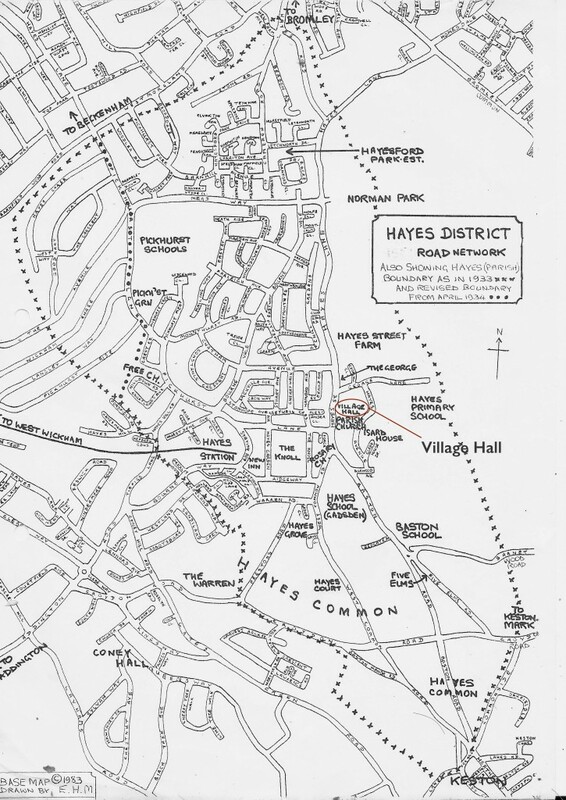 Hayes Village Hall is in Hayes Street, on the B265 from Bromley to Keston and Biggin Hill. from Bromley (Masons Hill/Bromley Common): leave A21 at Hayes Lane traffic lights for B265. Hayes Village Hall is about 1 ½ miles from Bromley, on the left after the George (Ember) pub/restaurant. from the south, go via A233 then B265 from Biggin Hill and Keston direction; or A21/A232/B265 from Sevenoaks and Green Street Green; or A232/B265 from Orpington via Locks Bottom. from Addington or West Wickham go via A232 and turn left at Hayes Common traffic lights to B265. from Beckenham and Park Langley, go via B251 to junction with B265, then turn left. if using satnav, tap in BR2 7LE; this will take you to the shops opposite the Hall. Parking: in Hayes Street or nearby roads. Route 119 (every 10 mins, evenings 15 mins) from Bromley, or from Croydon via Shirley and West Wickham, or 146 (hourly) from Bromley. Alight at Hayes, George Lane; route 353 from Addington Tramlink or from Orpington (every 15 mins, evenings 30 mins); alight at Hayes Library. Southeastern to Hayes Kent from London Charing Cross via Catford Bridge and Beckenham; then 119 bus from Hayes station towards Bromley (3 stops), alight at George Lane.